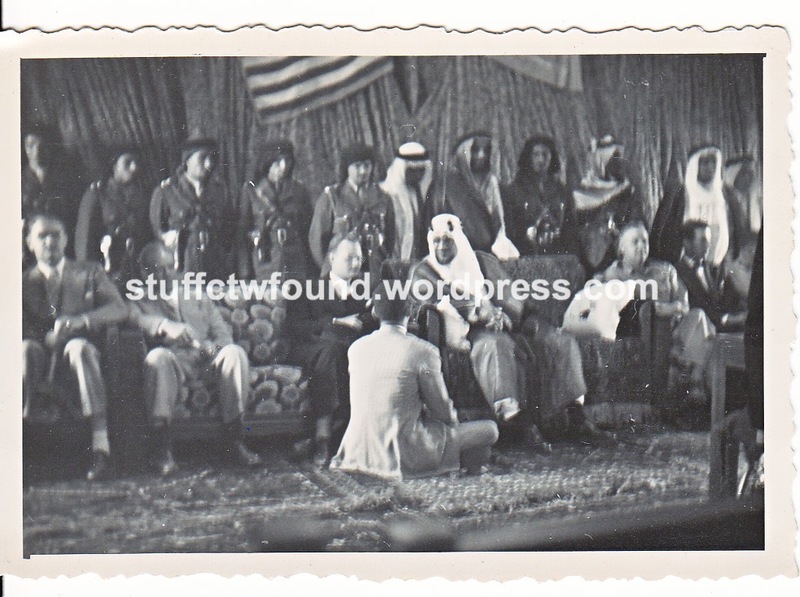 Also in the batch of photographs belonging to Victor Joseph Crepeau were several dozen associated with a visit to Dhahran by Saudi Crown Prince Saud Ibn Abdul Aziz. 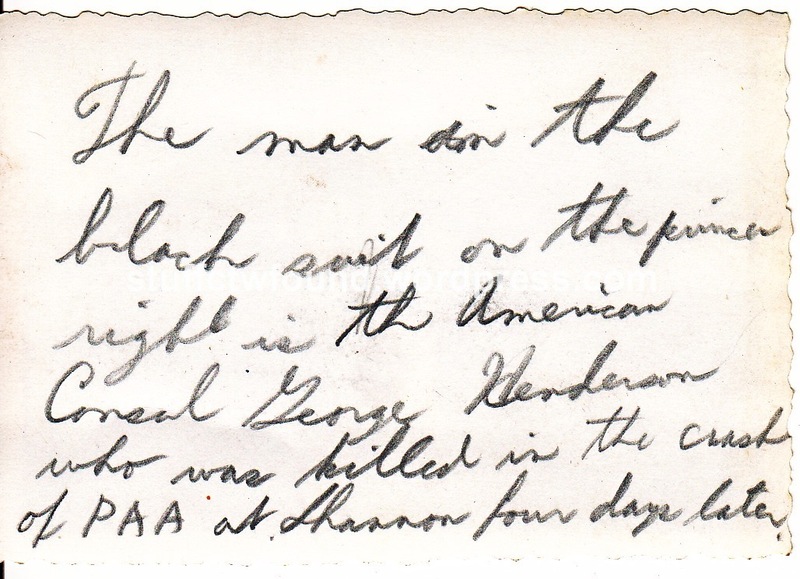 The inscription on the back of this photograph says, “The man in the black suit on the prince’s right is the American Consul George Henderson who was killed in the crash of PAA at Shannon four days later.” That crash occurred on 15 April 1948, so according to the inscription this photograph was taken on 11 April 1948. Also pictured are ARAMCO vice presidents Fred Davies and Floyd Ohliger. George Dailey Henderson had recently been appointed Consul General in Dhahran. He graduated from Stanford in 1938 with a BA in political science and joined the foreign service the next year. Before Dhahran he served in Mexico, Paraguay, Albania, and Italy. 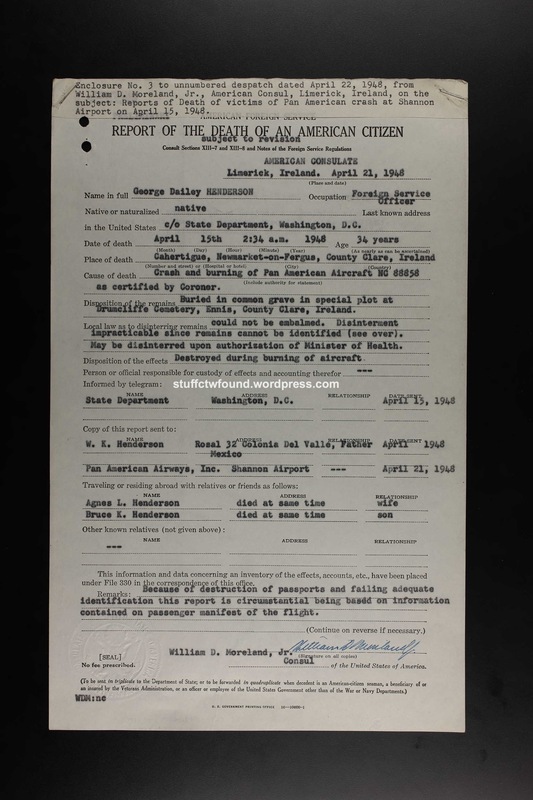 Henderson, his wife Agnes Lengyel Henderson, and their 13-month-old son Bruce Kirk Henderson all perished when their Pan American Airlines “Empress of the Skies” crashed and burned while making a second attempt to land at Shannon Airport in Ireland. The Hendersons were making their way to the U.S. for four months of home leave; they had not had leave in their nine years abroad as a diplomatic family. Altogether 30 people died, including 19 Americans and Sir Homi Metha, an Indian industrialist. Marc Worst, a Lockheed employee from California who was posted at Shannon Airport, was the only survivor. Here is a piece about the crash by Lorcan Clancy which was broadcast on The History Show on RTÉ Radio 1. Below is a report on the accident from the American Consulate, Limerick. Among the dozens of photographs associated with the prince’s visit were the following four. Two show the prince’s arrival and the fourth shows the cars with huge tires described in the above article. The writing in the above photograph is the end of the Arabic spelling of ARAMCO.